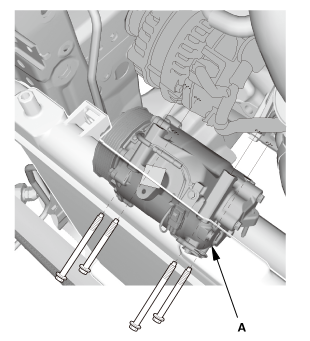 If accidental system discharge occurs, ventilate the work area before resuming service. Do not install an A/C compressor into a system unless you are completely sure that the system is free of contamination. Installing the A/C compressor into a contaminated system can result in premature A/C compressor failure. To avoid damage to the radiator, cover it with cardboard when removing any of fan shroud. 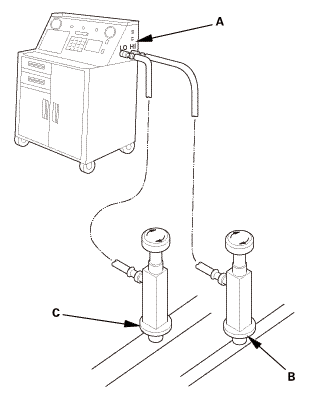 Connect an R-134a refrigerant recovery/recycling/charging station (A) to the high-pressure service port (B) and the low-pressure service port (C), as shown, following the equipment manufacturer's instructions. 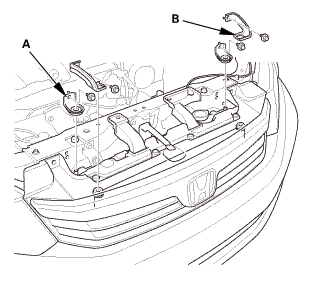 Disconnect the suction hose (B) and the discharge hose (C). NOTE: Plug or cap the lines immediately after disconnecting them to avoid moisture and dust contamination. Remove the A/C compressor (A). NOTE: Be careful not to damage the radiator fins when removing the A/C compressor. Do not operate the leak detector near flammable vapors. Its sensor operates at high temperatures, and could ignite the vapors, resulting in personal injury and/or damage to the equipment. If an accidental system discharge occurs, ventilate the work area before resuming service. Check the system for leaks using an R-134a refrigerant leak detector with an accuracy of 14 g (0.5 oz) per year or better. 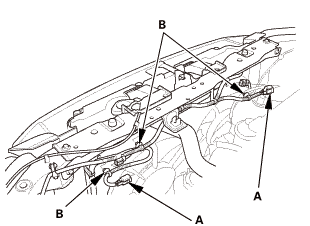 Inspect the A/C lines for any signs of contamination. If you're installing a new A/C compressor, you must calculate the amount of refrigerant oil to be removed from it. A new A/C compressor comes with a full charge of oil. Use only PAG refrigerant oil (SP-10) for HFC-134a A/C systems. Be careful not to damage the radiator fins when installing the A/C compressor, the alternator or the A/C condenser fan shroud. It is important to have the correct amount of refrigerant oil in the A/C system to ensure proper lubrication of the A/C compressor. Too little oil damages the A/C compressor; too much oil reduces the cooling capacity of the system, and can produce high vent temperatures. Since the oil separator is equipped inside the A/C compressor for this vehicle, oil drainage is unnecessary at the time of A/C compressor replacement. 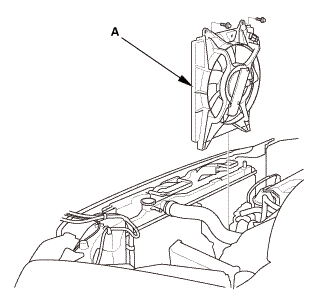 Install the A/C compressor (A). Remove the plugs or caps. 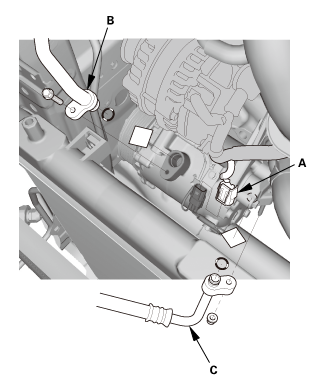 Connect the suction hose (A) with a new O-ring (B) that is lubricated with clean refrigerant oil. 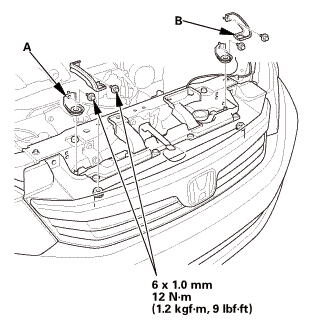 Connect the discharge hose (C) with a new O-ring (D) that is lubricated with clean refrigerant oil. Evacuate the system. The vacuum pump should run for a minimum of 30 minutes to eliminate all moisture from the system. When the suction gauge reads -93.3 kPa (-700 mmHg, -27.55 inHg) for at least 30 minutes, close all valves, and turn off the vacuum pump. If the suction gauge dose not reach approximately -93.3 kPa (-700 mmHg, -27.55 inHg) in 15 minutes, there is probably a large leak in the system. Partially charge the system, and check for leaks. Charge the system with the specified amount of R-134a refrigerant. Do not overcharge the system; the A/C compressor will be damaged. Select the appropriate units of measure for your refrigerant charging station. Position the vehicle in a wind-free work area. This will aid in detecting small leaks. When using the leak detector for the first time, allow it to warm up for 2 minutes with the probe in a clean atmosphere. This lets the temperature sensor in the detector stabilize. The calibration check should be done in the ‘‘Search 2’’ mode. Once that is done, the other check modes do not need calibrating. 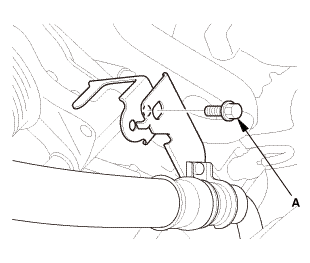 When leak checking through the HVAC module drain hose, avoid drawing water into the probe. Water can damage the internal pump and sensor. Avoid creasing the flexible probe extension. Creases can restrict air flow and give false readings. Because the detector recalibrates itself for ambient gases, it may be necessary to move the detector away from the leak to clear the sensor. 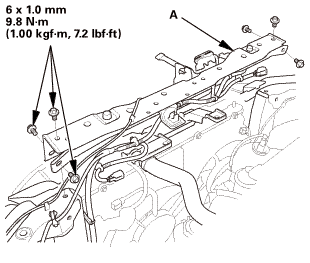 Once the sensor has cleared, recheck the suspected leak. When removing the clear probe tip, be careful not to lose the flow ball. 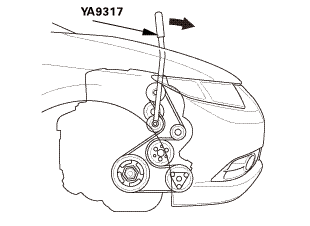 R-134a is heavier than air; always check below and to the sides of all potential leak sources. Halogen leak detectors are sensitive to chemicals: windshield washing solutions, solvents/cleaners, and some vehicle adhesives. Keep these chemicals out of the area when doing leak detection. Use only Tracer-Stick single dose fluorescent dye capsules from Tracerline®. Other dyes contain solvents that may contaminate the refrigerant oil, leading to component failure. Adding excessive amounts of dye can damage the A/C compressor. 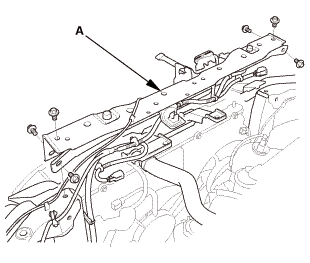 PAG oil is water soluble, so condensation on the evaporator core or the refrigerant lines may wash the PAG oil and fluorescent dye away from the actual leak. Condensation may also carry dye through the HVAC module drain. After checking and repairing leaks, thoroughly clean any residual dye from the areas where leaks were found. Use GLO-AWAY dye cleaner, from Tracerline®, and hot water to remove the dye (follow the instructions on the bottle). Residual dye stains can cause misdiagnosis of any future A/C system leaks. Carefully wash the affected surfaces to remove any dirt, and to prevent paint scratching. Mix water and isopropyl alcohol in a 50/50 mixture. Soak a soft 100 % cotton towel with the water/alcohol mixture, and place the cloth on the affected areas to remove the dye. After removing the dye with the water/alcohol-soaked cloth, carefully wash the affected areas, and check that there is no remaining dye. 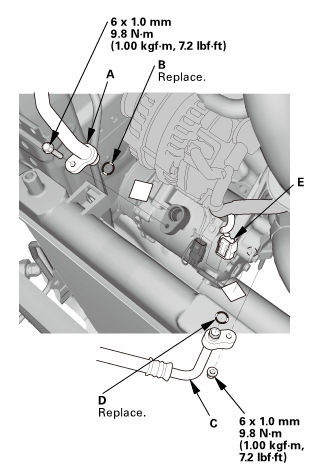 Close the quick coupler valves, then disconnect the quick couplers from the vehicle service ports. Attach the universal connect set, from the Optimax Jr. Leak Detection Kit, to the service valve fitting. Close the control valve (the black knob on the connect set). Attach the charging station low pressure hose quick coupler to the service valve fitting, and open the quick coupler valve. Evacuate the connect set using the charging station vacuum pump, then close the quick coupler valve. Detach the universal connect set, and install a Tracer-Stick® dye capsule between the connect set and the service valve fitting (see the manufacturer's instructions for more detail). 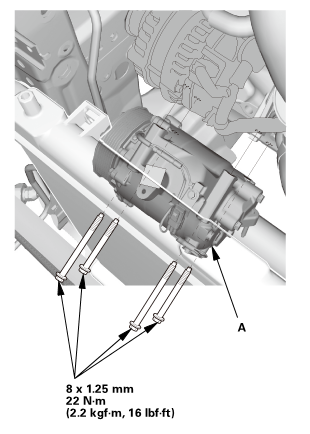 Attach the quick coupler on the universal connect set to the low pressure service port on the vehicle. Open the charging station low pressure hose quick coupler valve, but do not open the control valve. Start the engine, and set the A/C system to maximum cooling. 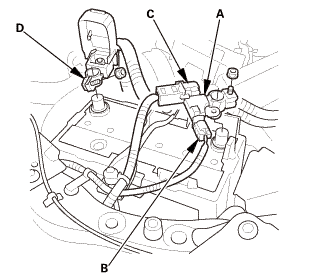 Open the control valve to let refrigerant and the dye enter the A/C system through the low pressure service port. Close the control valve when the Tracer-Stick® dye capsule is empty. Check for leaks in a dark work area, and use the UV light and the special glasses from the leak check kit. Other UV lights may not work well with the Tracer-Stick® dye. 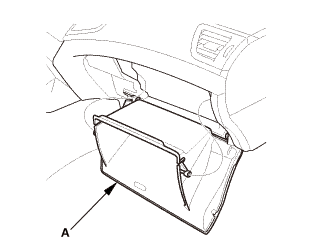 Small leaks may take up to 1 week of vehicle operation (with normal A/C use) to become visible. 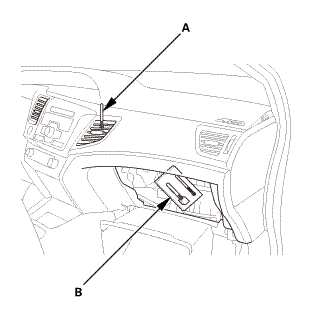 Insert a thermometer (A) in the center vent. 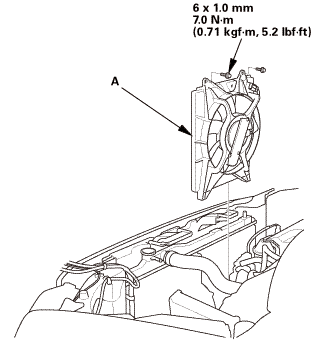 Place a hygro-thermometer (B) near the blower unit's recirculation inlet duct. Move the vehicle out of direct sunlight and let it cool down to the surrounding (ambient) temperature. If necessary, wash the vehicle to cool it down more quickly. The blower intake temperature must be at least 68 °F (20 °C). Set the temperature control dial or temperature control button to MAX COOL, the mode control button to VENT, and the recirculation control button to RECIRCULATE. Set the A/C button on and the fan control dial or fan control button to Max. Run the engine at 1,500 rpm. No driver or passengers in vehicle. A/C compressor clutch not engaged. If you observe any of these conditions, refer to the Symptom Troubleshooting Index. After running the air conditioning for 10 minutes under the above test conditions, read the delivery temperature from the thermometer in the center vent, the blower intake temperature near the blower unit, and the discharge (high) and suction (low) pressures on the A/C gauges. Mark the vent (delivery) temperature on the vertical line. Mark the blower intake temperature on the bottom line. 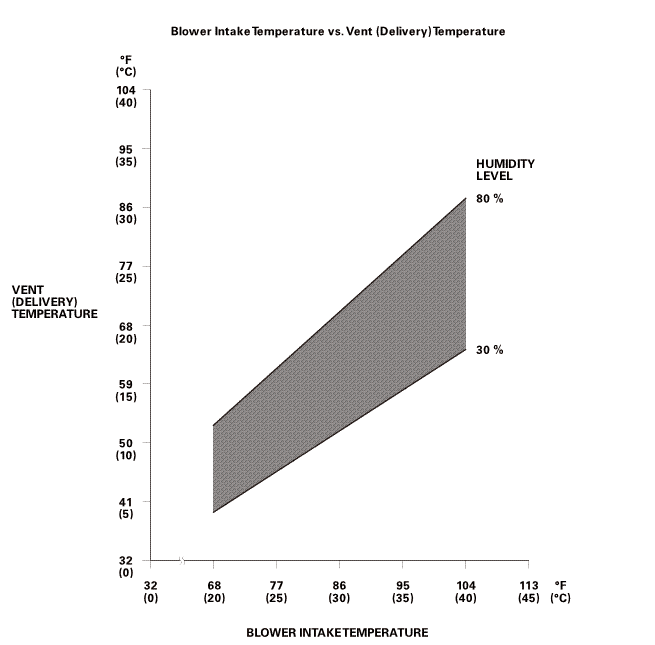 Draw a vertical line from the blower intake temperature mark. Draw a horizontal line from the vent (delivery) temperature mark until it intersects the vertical line. NOTE: The vent (delivery) temperature and blower intake temperature should intersect in the shaded area. Any measurements outside the line may indicate the need for further inspection. Mark the high side (discharge) pressure on the vertical line. Draw a horizontal line from the high side (discharge) pressure mark until it intersects the vertical line. 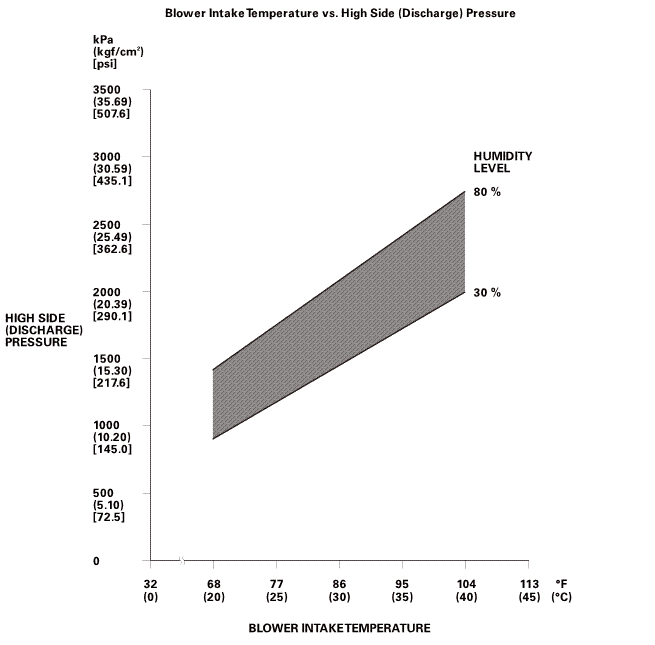 NOTE: The high side (discharge) pressure and blower intake temperature should intersect in the shaded area. Any measurements outside the line may indicate the need for further inspection. Mark the low side (suction) pressure along the vertical line. 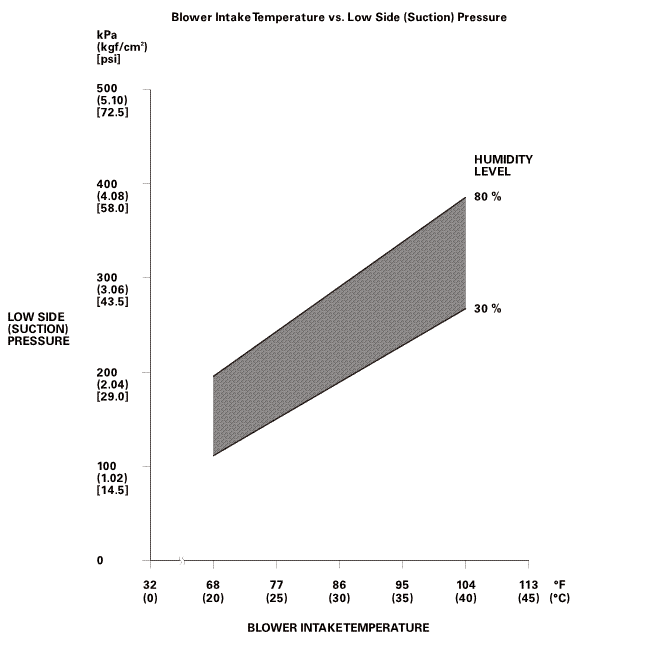 Mark the blower intake temperature along the bottom line. Draw a horizontal line from the low side (suction) pressure mark until it intersects the vertical line. 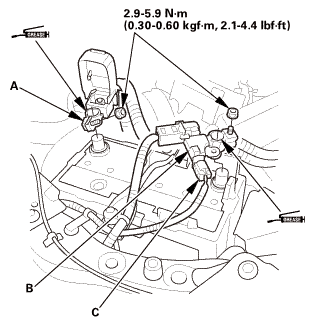 NOTE: The low side (suction) pressure and blower intake temperature should intersect in the shaded area. Any measurements outside the line may indicate the need for further inspection.